Very nice, thanks! I especially like the hotkey. This ignore programs feature will be nice if I find something is isn't working with, but it seems to play well with Excel now (the previous version had problems with Excel). @David: I made many improvements for application compatibility as well, I'm glad to hear they paid off. It's awesome Jon. Makes my desk look awesome with the dual monitors. One little thing tho is that i'll get a little blue or orange square on my screen. Kinda strange but will hopefully be fixed in the future. @WinLinOSX: I'm glad to hear you're enjoying DisplayFusion! 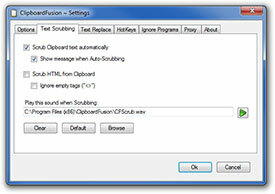 @Chris: Starting with 1.5 you can assign a HotKey to scrub text, instead of having it auto-scrubbed. You just can't assign Ctrl + C.